One of several buildings at the Fishers Loft Inn. This one houses the Garden Rooms. 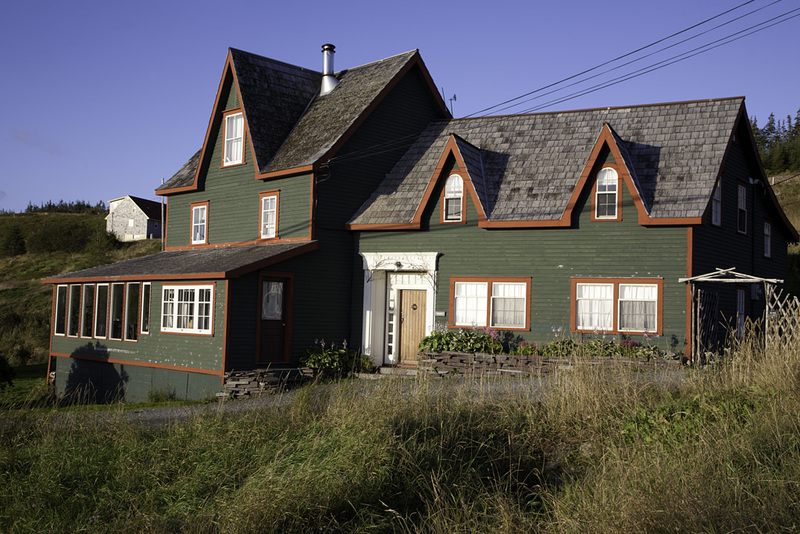 Our side trip to Twillingate resulted in a late arrival at the Fishers Loft Inn in Port Rexton. The weather along the way soured on us, we were slowed by construction in the vicinity of Terra Nova National Park, and the Highway 233 (aka Bunyan’s Cove Road) option put us onto a dark, narrow stretch of highway and potentially on a collision course with moose (there are more than 50 collisions per month during the summer season). Highway 230, although a little bit out of the way, would have been a safer option. We finally arrived at about 10pm. The front desk was closed by this time, but a note was pinned to the door of the main building explaining how to get to our room (unlocked) and settle in. Everything worked out just fine in the end. On our first full day in the area, we had breakfast at the Inn, and headed off to check out the Skerwink Trail. The sky was overcast, but not threatening. Finding the trail was somewhat confusing, but we were successful and had a great time. You can read more about this outing here. Later that day, we enjoyed lunch at Eriksen Premises before going on an extended walk around the Trinity townsite. 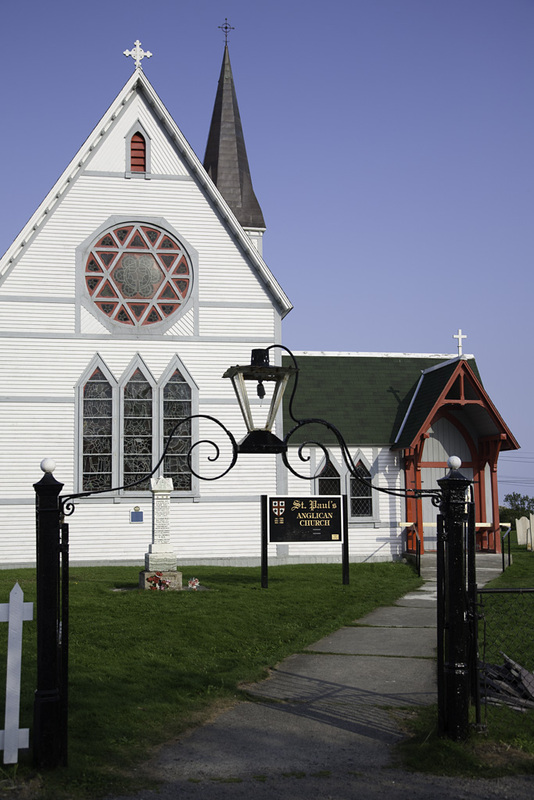 We devoted a lot of time to visiting the cemetery and church proper at St. Paul’s Anglican Church. We were impressed by the age of some of the tombstones in the cemetery, as we were by woodwork in the church itself. We got back to the car and drove out to Fort Point (consulting a map beforehand is highly recommended!). The fort and lighthouse sit on a point with a direct view of Port Rexton on the opposite shore. We ambled along the beach and paid particular attention to the sea urchin carcasses left behind by the seagulls. This first full day was capped off with dinner at the Twine Loft. The warm wooden interior, main courses and desert enchanted throughout the entire evening. We visited the library upstairs, and stumbled upon a book devoted to Hurricane Igor which made landfall in this area the year before. The timing of this discovery was quite fitting – Hurricane Maria was expected to hit our area the next day! Our second day in the area started with us spending an inordinate amount of time glued to The Weather Network, and watching their hurricane “alerts” for the area. As a hike leader, I learned that The Weather Network channel is a commercial enterprise with an interest in keeping viewers glued to them for updates. In the end, we did venture out that morning to inspect the wave action at Dog Cove (a 3 minute drive from the Fishers Loft Inn). Satisfied that the end of the world was not imminent (as The Weather Network had forecasted), we headed out by car to make the best of what was left of the day to visit the Bonavista Peninsula. We were barely 15 minutes into the road trip when we realized that the high winds blowing across the tundra like landscape threatened to push our small car, and us, into the ditch. Time to head back to the warmth and comfort of our room at the Fishers Loft Inn! This second day of adventure as capped off with dinner at the Fishers Loft Inn. Our 3rd day was promising – clear skies and an inviting temperature! We were so impressed with the Skerwink Trail that we decided to do it again, but under blue skies this time. With the trail behind us, we packed up and grabbed a fantastic lunch at the Two Whales Coffee Shop on the highway – this is a must if you are in the area!